An exceptional Brandy de Jerez, aged for an average of 15 years in Oloroso and Pedro Ximénez Sherry Wine casks. Cardenal Mendoza Clásico is a Solera Gran Reserva Brandy created from a selection of the best holandas (the finest spirit, distilled slowly in alquitaras or pot stills) which are aged in the traditional system known as soleras and criaderas. The Cardenal Mendoza solera is one of the biggest in Jerez and consists of barrels seasoned with Oloroso and Pedro Ximénez Sherry. The scale of this solera guarantees proper ageing for an average of fifteen years and exceptional quality. In 1877 the Sánchez Romate family started producing brandy for private consumption. 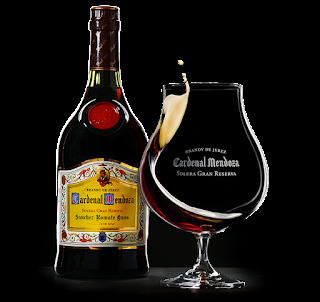 Word of its fine quality spread and the bodega decided to bottle it for commercial sale with the name Cardenal Mendoza. The name pays homage to the first Cardenal Mendoza, Don Pedro González de Mendoza (1423-1495), a prominent historical figure in15th century Spain. As counsellor to King Fernando II and Queen Isabel I, he had the complete confidence of the Queen and played decisive roles in supporting Columbus’ first voyage to the Americas and in the unification of Spain.